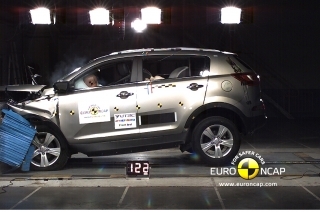 Two of Kia's latest vehicles, Sportage and Venga, have both been awarded the top 5-star safety rating by leading independent European safety organisation, Euro NCAP. The Kia Sportage crossover and Venga B-segment MPV were both given the maximum 5-star rating, placing them at the top of their respective classes and in the distinguished company of other Kia models such as the Soul, cee'd and Sorento. Kia Sportage obtained scores of 93 per cent for Adult Occupant Protection, 86 per cent for Child Occupant protection, 49 per cent for Pedestrian Protection and 86 per cent for Safety Assist. Venga scored 89, 85, 64 and 71 respectively, in the same categories. Sportage and Venga also received praise for having Electronic Stability Control (ESC) fitted as standard in most markets. "These latest results from Euro NCAP highlight Kia's commitment to ensuring exceptional levels of safety in its vehicles," commented Benny Oeyen, Vice-President, Marketing & Product Planning, Kia Motors Europe. "In the first instance, Kia's engineers strive to design vehicles that make it easier for drivers to avoid hazards, thanks to good visibility, powerful braking and excellent road holding. However, in the event that an accident is unavoidable, Kia owners also have peace of mind that they and their passengers are protected by the very best passive safety technology," Oeyen concluded. The Kia Venga was originally tested in early 2010 and was awarded a four-star rating. Not content with a less-than-perfect score, Kia's engineers subsequently made a number of minor changes to the car and brought Venga back to Euro NCAP for retesting. The revised model specification, which entered production in September 2010, performed strongly in all test areas to secure the maximum 5-star rating. All Vengas sold in Europe offer buyers ABS with Brake Assist System (BAS), Electronic Stability Control (ESC) with Hill Assist Control (HAC), six airbags (dual front, side and full-length curtain), front passenger airbag cut-off switch, active front head rests, all-round three-point seatbelts with front-belt pre-tensioners and reminder warning, ISOFIX child seat top tethers and anchors and impact-sensing auto door unlocking. Sportage buyers will find front, side and full-length curtain airbags with rollover sensor, front passenger airbag cut-off switch, active headrests, ABS, EBD, ESC with Downhill Brake Control (DBC), Cornering Brake Control (CBC), adaptive brake lights, all-round three-point seatbelts with front-belt pre-tensioners and load-limiters and ISOFIX child seat top tethers and anchor fixings all as standard across the European model range. The Kia cee'd earned a 5-star rating Euro NCAP in 2007 - the first Korean brand vehicle to achieve this top safety rating. 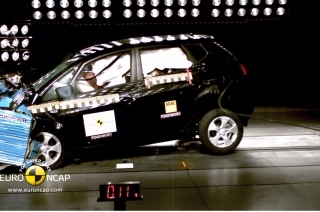 Starting in January 2009, Euro NCAP revised its testing strategy to encompass four safety aspects - Adult Occupant Protection, Child Protection, Pedestrian Protection and Safety Assist - which contribute 50%, 20%, 20% and 10% respectively to the overall score, which is expressed as a star rating. Ratings achieved under the pre-2009 rating are not comparable with those achieved under the new scheme.